With this week's Rewarding Times, is a special Family pack of 4 of the patented Flossing toothbrush by Mouthwatchers. Also included in the pack are two travel sized toothbrushes. There are a number of points of differentiation that exist between your standard toothbrush and a MouthWatchers toothbrush. 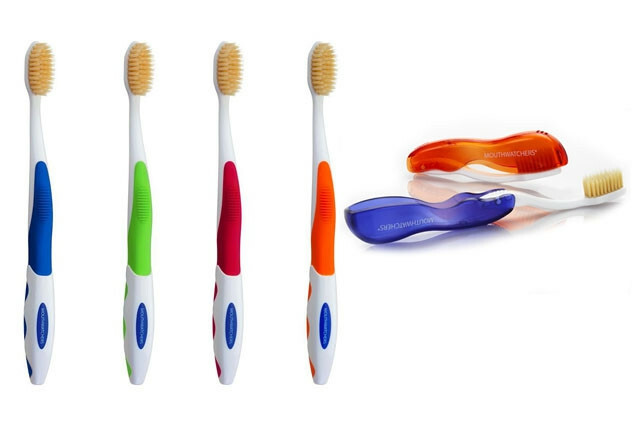 Primarily, the MouthWatchers toothbrushes feature antibacterial bristles embedded with silver. These bristles are not coated, sprayed or dipped in silver and the antibacterial properties of the bristles do not wear off with use. More importantly, there is no risk of accidental silver ingestion on the part of the brusher. MouthWatchers toothbrush bristles are manufactured by melting the polyester with the silver in power and extracting the bristles from the mixture, so that the silver is part of the “fabric”. For this reason, the MouthWatchers toothbrushes are 99.9% bacteria-free within six hours of brushing, and this antibacterial power does not weaken with time. This feature is incredibly important when it comes to those with a vulnerable immune system, such as hospital patients and the elderly. MouthWatchers bristles are also extra-soft (perfect for sensitive mouths and critical for avoiding gum recession) as well as pointy (for breaking up plaque). MouthWatchers patented, scientifically designed bristles are also the thinnest on the market (one micro-meter at the tip) so that they can reach areas of the mouth that other brushes miss and brush away plaque in the deep grooves where 90% of cavities form. MouthWatchers bristles are so thin and nimble that they are able to get between teeth and mimic the action of flossing. While these toothbrushes do not replace the act of flossing, they can be useful for those who sometimes forget to make a habit of flossing after each brushing. The revolutionary Mouthwatcher Toothbrush offers the natural bactericidal properties of silver which has been nano coated onto every bristle to help ensure that your oral hygiene is second to none. The Mouthwatcher toothbrush also presents a unique Flossing Bristles™ which consists of long, soft dental floss bristles for cleaning between teeth and in hard to reach locations; thicker, harder inner bristles ensure complete cleaning. The combination of these bristles ensure that they are great for sensitive gums and can be used safely with braces. Made from advanced PBT plastics, these bristles outlast less expensive nylon bristles found on competitive toothbrushes. The adult version of the Mouthwatcher brush contains a full 2,116 bristles in every head. The youth version of the Mouthwatcher brush is slightly smaller than the adult version to accommodate the smaller mouth and contains 1,288 bristles in every head.